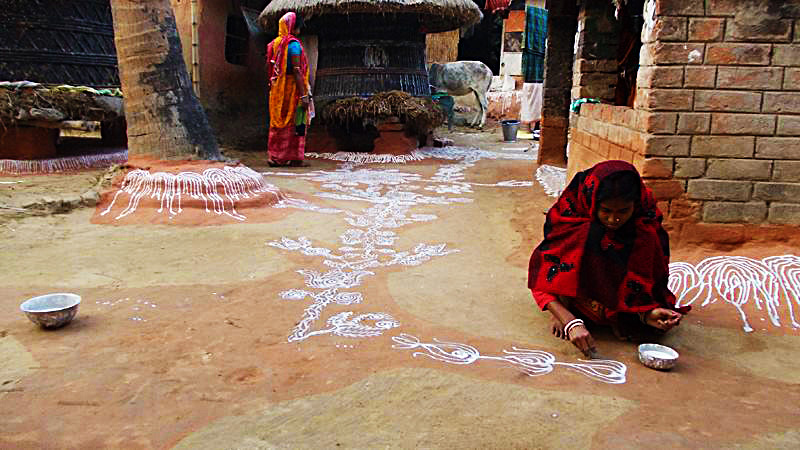 Alpona is the domestic ritual art of the women of rural Bengal intrinsically linked with folk rites known as "brotos". Brotos are specific rites undertaken with a view to achieving fulfilment of specific desires. They have been in existence for centuries in Bengal and the rest of India and have been practised in particular by womenfolk. Essentially primitive in origin, these were vows undertaken by women of all ages to satisfy the forces of nature and thus obtain divine blessings for peace, well being and safety of their family and kinsmen. Brotos in eastern India were already an ancient tradition when these rituals were described in Shib Chunder Bose`s book of 1881, "Hindoos as they are". Performed by women of all ages, and handed down from generation to generation, the brotos symbolised a woman`s desire for domestic peace, harmony, prosperity and fertility. They were conducted in the sanctity of her home. These were looked upon as magico-religious rites. But, they were also a way of inculcating in young girls, the right values and ideals in leading a harmonious life. Many of these brotos were later assimilated into Brahmanical Hinduism and were known as the Shastrik brotos. Thus several brotos moved to the temples and were suitably redesigned for the brahmin`s benefit. Thus folk brotos have been conducted by the women while shastrik brotos became the brahmin`s domain. 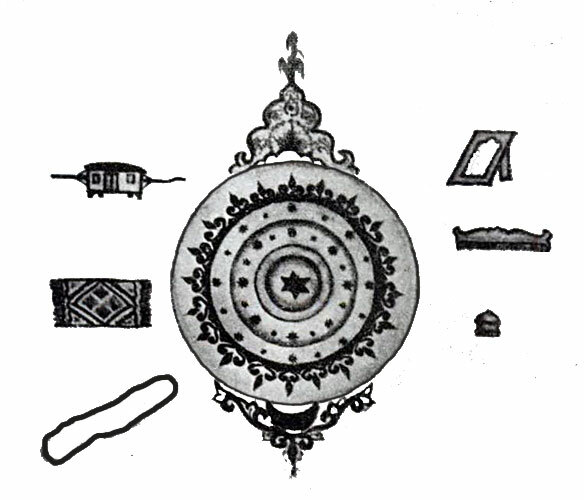 In the agrarian life of rural Bengal, the observance of a folk broto has always been preceded by the ritual drawing of specific decorative motifs known as Alpona. Once the alpona was ready, a puja would be conducted by the woman at the site of the alpona in conjunction with the chanting of specific “magic” verses (chharas). The broto would end with the narration of stories (Broto Katha) eulogizing the deity. It was believed that the force generated from this “magic” would yield the desired results. Many believe that the word ‘alpona’ originated from the Sanskrit word ‘Alimpan’ - which means to spread over. In rural Bengal the art of alpona drawing has been handed down through generations, varying in minor detail from community to community. By the simple act of dipping a rag in a paste made from rice powder, women created wonderful replicas of their desired objects, in rhythmic, fluid lines - to decorate floors, walls and door posts. The artist begins her work from the centre and works outwards. Each stroke is applied using the ring finger of her right hand, while the quantity of paste dripping from the rag is controlled by appropriate pressure from the thumb. Each broto was performed for a different reason and thus the alpona varied with the broto. From the time a girl turned five or six, she would be initiated into the brota rituals by an older woman, her mother or grandmother or a female relative or neighbour. She would be taught to observe these brotos: to pluck flowers, dig pits for the brotos, draw alponas associated with the broto and recite the chhoras and broto kothas. Each folk alpona has a set of ritual forms, which depict a ritualistic expression of the rural Bengali woman’s hopes and aspirations. She believed that in reproducing an image(s) of her goal, her wishes would be fulfilled. However, guided by her intrinsic creativity, she did not rest until the “sign” painting was embellished with her innate artistry. Other than floors and walls, alponas were also painted on earthenware pots, winnowing trays, low wooden stools (piris) and paddy-bins for occasions like weddings and other important religious and social ceremonies. Brotos traditionally have been associated with agriculture - for the fertility of the soil, to induce rain and to protect crops, as well as human fertility. They are also observed to cure diseases, evade disaster, grant good husbands and a variety of miscellaneous needs. Sometimes, the object of these brotos were negative - a desire to harm others - particularly, the co-wife. Since alponas are specific to each rite, the variety of themes of the alpona is remarkable. From blooming lotuses and entwined creepers, to elephants and horses, paddy threshing and ducks swimming in ponds, boats and palanquins, combs and mirrors , stars and the planets – all of these and much more find expression in the alponas of Bengal. The symbols or the patterns drawn would give out a message, understood by people who knew its purpose. Thus the picture of a paddy field or birds would mean the desire for more crops. The picture of goddess Lakshmi’s feet would mean the desire for more money or for the wife to be treated like a goddess. In the monsoon month of Bhadro, (midAugust to mid September), the Bhaduli Broto is observed by rural Bengal. This broto possibly originated in an ancient age when Bengal was at the height of its maritime activities. Floods and capsizes being frequent occurrences, images of seven seas, thirteen rivers, mountains, the weaver bird (Babui) nest, boats were drawn and the goddess Bhadrakali invoked to facilitate the safe return of loved ones from such disasters. Today, it is also observed by the wives of fishermen for their husbands` safety. On the full moon night in the month of September-October (Ashwin), the Lakshmi (Kojagori Lokkhi) Broto is observed. This is actually a primitive agricultural rite later transformed into Lakshmi Puja. Lakshmi, the goddess of wealth and prosperity, was originally a primitive corn goddess later absorbed into Hinduism. The subjects of these alponas are objects associated with the Hindu goddess: the owl – her vehicle, her footprints, the lotus, along with the primitive references to agriculture like a sheaf of paddy, furrowed land and the shankhalata and kolmilata creepers. The actual rite takes place at night but the whole day is spent in drawing alpona all over the house and its surrounds. The Bipottarini Broto is observed to negate bad omens and impending difficulties. There were also brotos that were observed for the growth and protection of a farmer’s crops. There is also a broto, performed by women, to curse and punish the “other woman” or co-wife in their husband’s life. Brotos and their corresponding alponas have mainly been the domain of the rural Bengali woman, with the rituals and celebrations being her chief form of recreation. Thus, in a way, brotos empowered these women and gave them an arena for creativity. But sadly, ritual alponas are gradually being forgotten, along with the brotos. And gradually, over time, many brotos ceased to be purely in the woman`s domain, having been appropriated by Brahmin priests. Moreover, in course of time, the original purpose of many brotos has been lost in obscurity, or has changed due to the influence of religion. And today, among the folk brotos that remain, there is often no correlation between the broto katha, the chhara and the reason for the broto. 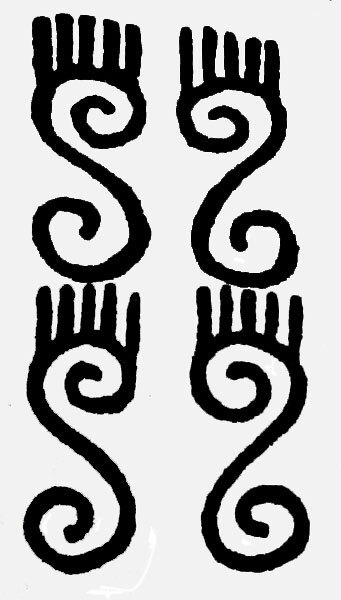 However, the motifs drawn in the alpona are usually the best indicator for the original purpose of the broto. A case in point is the Punnipukur (or Purnipukur) broto, which is observed just as lakes and ponds begin to dry up in summer. The broto was originally conducted for rains but the chharas contain prayers for good fortune, offspring and there is mention of Siva and Narayan. These changes must have come about after brotos began to be incorporated into the Brahmanical fold. Such was the grace and elegance of these alponas that the poet Rabindranath Tagore assigned his nephew Abanindranath to the task of documenting Broto Kathas and their corresponding alponas.  Later, this was included as a subject in the Visva Bharati University`s curriculum as a refined art. 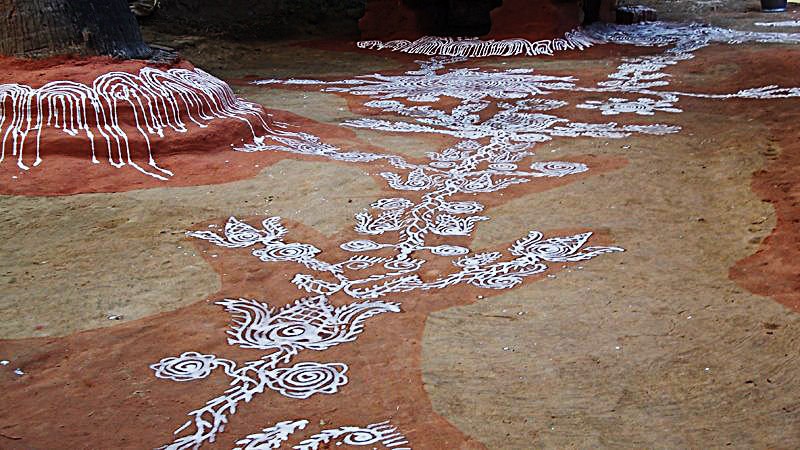 Thus began the transformation of a ritual folk motif, spontaneously created by rural women, into a highly developed urban decorative art. 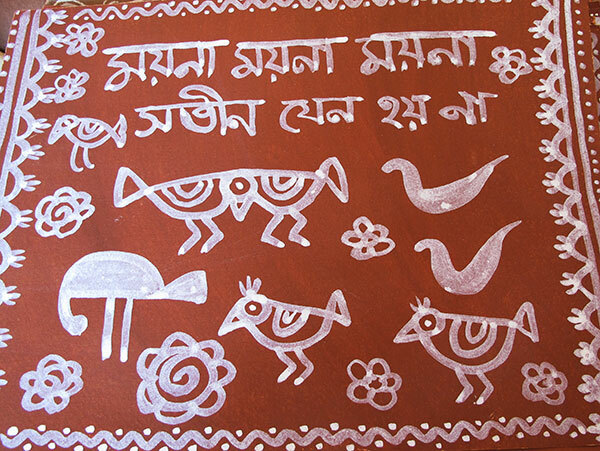 In urban Bengal, alpona art is associated only with the Shantiniketan style of alpona. A strange phenomenon has been noticed in recent times. Rural women, have less time on their hands, either because they are working as daily labour or, because cable TV has reached their villages. As a result, many of these beautiful, quaint rituals are being given a miss - excepting for very special occasions. In homes where the grandmother is still around, the younger girls, perforce have to adhere to these rituals - albeit reluctantly. In the face of these disappearing customs, a young man in a village in Nadia, Rabi Biswas, has taken upon himself the charge of keeping these alponas alive. He has learnt from his grandmother and all the other grandmothers in the village, and is the main alpona artist of his home and village. He has also researched alponas across districts, learning and documenting, before this art succumbs to the idiot box. A few other young men in his village have also been inspired by him. In Rabi Biswas`s experience, the young women of the villages earn a decent wage from cutting supari (betel nuts) which are exported and therefore prefer to earn than paint alponas. Therefore, come festival or ritual time, they prefer to hand over charge of painting alponas to their brothers. In the years that he has been researching, since 2007, he has found that alpona paintings in rural households has dropped from 80% to 30% in 2013. The few that are painted are either sketchily done or painted by the boys. Shortcuts prevail. Worse, alpona stickers have also found their way into the market.